What is going on in consumers’ minds, individually, when they decide whether or not to buy—or, in the case of a not-for-profit consumer, acquire—a particular offering? In this article, we want to shed light on the process consumers go through when making acquisitions by exploring the consumer acquisition process. The consumer acquisition process consists of six distinct stages, which a consumer goes through when evaluating and making purchase decisions. 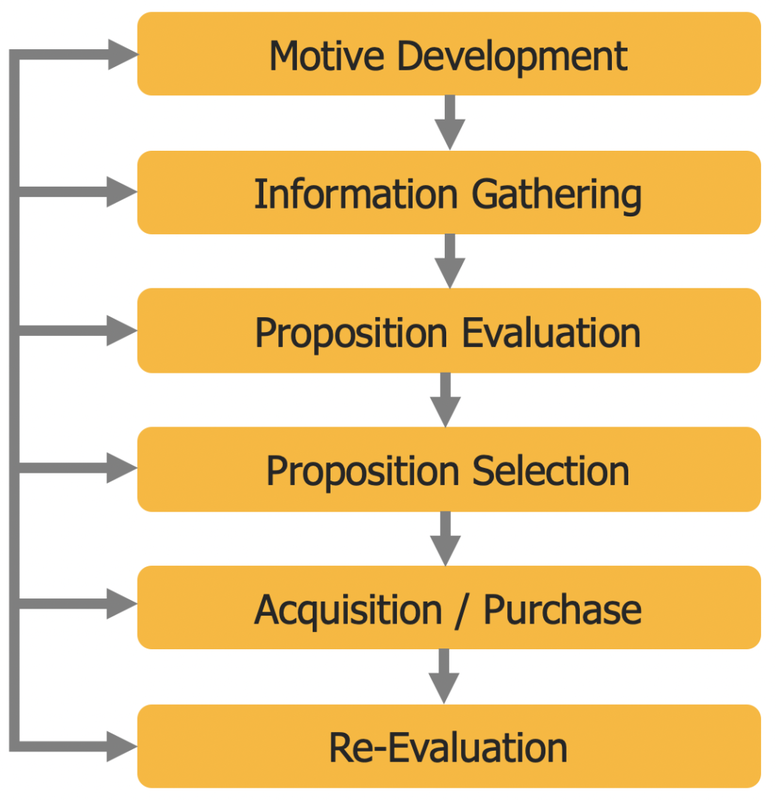 As can be taken from the diagram, the consumer acquisition process is iterative, because each stage can lead back to any of the previous stages in the process or move forward to the next stage in the process. In the following, we will investigate each of the six phases of the consumer acquisition process more closely. First, consumers decide that they need to acquire an offering. This involves the initial recognition that some sort of problem needs solving. To solve the buying problem, the consumer must first become aware of it. For instance, a lady might decide to buy new swimwear for a holiday, or because she’s grown tired of what she had before, or because she thinks it’s out of fashion, or to cheer herself up. Next, as consumers, we look for alternative ways of solving our problems. With the swimwear buyer, she might ask herself where she bought her bikini before, how much bikinis generally cost, what retail outlets sell bikinis, and so further. She might also ask herself where her friends normally buy bikinis, what kinds of bikini are fashionable at the moment, perhaps which retailers offer discounts, and which store staff treat her best. Her search for a solution may be active – that is, an overt search – or passive, which means that she is open to ways of solving her problem, but she is not actively looking for information to help her. The search for information may be internal or external. Internal means that she may consider what she already knows and the products that she might buy to solve her problem, while external implies that she feels that she doesn’t know enough about her problem, so she seeks advice or supplementary information to help her to decide. Once we feel that we have all of the information that we need to decide, we evaluate the proposition. For that, we first determine the criteria used to rank various offerings. These might be rational (such as cost) or irrational (for example, based on desire). For example, the swimwear buyer might ask herself which shop is the best value for money or which is the most fashionable retailer. The proposition that we eventually select is the one that we evaluate as fitting our needs best. However, the fact that we have decided on a particular proposition does not necessarily mean that we will actually buy the particular product. For example, the swimwear buyer might check the stock of a shop online and make her selection there, but when she turns up at the retailer to try it on, the bikini she wants is not available and so she decides to buy an alternative. Proposition selection is a separate stage in the consumer acquisition process, distinct from evaluation, because there are times when we must re-evaluate what we buy when what we want is not available. Once selection takes place, different approaches to acquisition might exist. For example, the swimwear buyer might make a routine purchase: a bikini from a shop that she’s always shopped at regularly. Because the purchase is regular, she will not become particularly involved in the decision-making process. She simply buys the proposition again that she has bought previously unless new circumstances arise. The purchase may be special, conducted on a one-off or infrequent basis, such as a bikini for a honeymoon in the Maldives. In this case, the swimwear buyer will need to become more involved in the decision-making process, to ensure that she understands what she is buying and that she is happy that it satisfies her needs. With infrequent (and large) purchases, the marketer should try to ease the pain of payment, for example by extending credit. The store’s policy on returns (that is, whether it allows this or not) may also have an impact on whether or not our consumer actually buys swimwear from a particular retailer. According to the theory of cognitive dissonance (Festinger, 1957), we are motivated to re-evaluate our beliefs, attitudes, opinions, or values if our position at one point in time is not the same as the position that we held at an earlier period due to some intervening event, circumstance, or action. This difference in evaluations is psychologically uncomfortable, causing anxiety. For example, we may feel foolish or regretful about a purchasing decision, so we may be motivated to reduce our anxiety by redefining our beliefs, attitudes, opinions, or values to make them consistent with our circumstances. We might actively avoid situations and information that increase our feeling of dissonance. The bikini buyer might be unhappy with her purchase because, although she liked it online, when she tried it on at home, it didn’t flatter her figure. Such a dissonance may be particularly acute in a purchase with high involvement, such as a car, a house, or a high-value investment product. As mentioned earlier, the consumer acquisition process is iterative. At the re-evaluation phase of the acquisition process, the re-evaluation can lead us back to any of the previous phases in the consumer acquisition process as a result of experiencing cognitive dissonance.